Initially, I thought it was the political season that was starting to irritate me with just about everyone around me. The ramp up of attack adds, manipulative facebook promotions, and “fair & balanced” media coverage began to develop an environment began to bring out the worst of character in just about everyone I know. Many who I thought to be loving and caring suddenly began to launch attacks those with differing views. Intelligent well intentioned individuals, attacking and countering their own friends with weapons supplied by groups trained and commissioned to develop well defined battle lines. Observing this who process I came to realization that,it is not the process that is so vexing, it is the ease at which we allow ourselves to become transformed. No matter how sweet and loving your goat may be with you, they will on occasion get violent with their herdmates. This is the natural ways of things, and no matter how you want them to always get along, there will be occasions where your goats fight and take “pot shots” at each other. They will fight between themselves to establish dominance and they will take “pot-shots” at smaller goats to show them who is boss. There is really nothing you can do to get them not to do this- it’s what goats do. Maybe you think being a goat is OK. You like goats and that is who you are. Well, all I can say it have fun with that, but fortunately, we don’t have to be goats and we don’t have act like goats. You are a brilliant-gifted writer. Spot on!! Thanks Brother. I think there is a fire brewing in me so keep me in your prayers that it is from Him and not me. 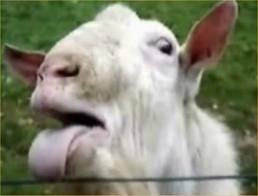 I feel the need to remind people that goats will eat garbage! (I know I am a former goat.) We need true disciples of Christ in order to heal our land. I also feel the need to say: That no time during this comment were goats in danger. I know we talked about this a little bit (and goodness knows, you’ve been teaching us about “The Sheep and the Goats” my whole life), but this was exactly what I needed to hear. I’ve been so discouraged, seeing posts on Facebook from fellow believers saying things like “all democrats will go to hell.” This was definitely the encouragement I needed, thank you for blessing me with it!